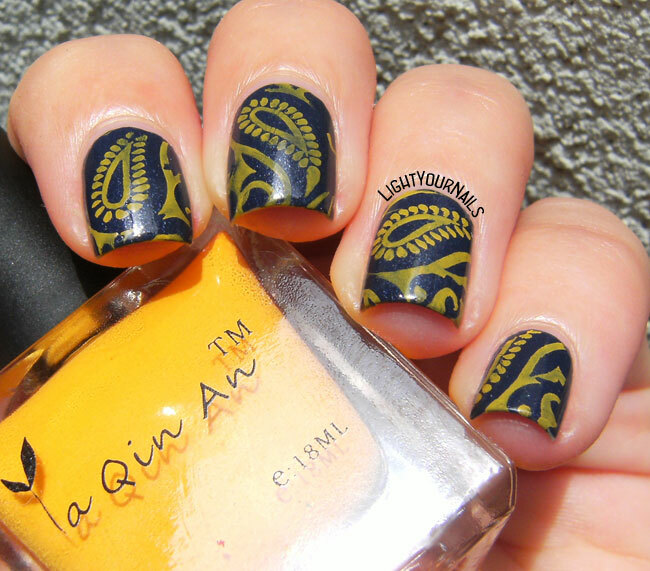 Blue and yellow paisley stamping | Light Your Nails! Oggi vi propongo una nail art che ho creato per il gruppo Facebook When Colors Collide. Il tema di questa settimana è “blu e giallo”, e io come sempre mi sono buttata sullo stamping, tecnica con cui mi sento abbastanza sicura. Il blu che ho usato è P2 Be My Guy, di cui vedrete presto la recensione, mentre lo smalto giallo è Ya Qin An #21. Ho provato prima con il giallo Konad ma si vedeva appena su questo blu scuro, invece gli smalti Ya Qin An e BornPrettyStore sono sempre coprenti al 100%, perfetti da usare su base scura. Ho sigillato tutto con il Flash Mat top coat di TNS Cosmetics. Today I’m bringing you a nail art I created for When Colors Collide group on Facebook. This week’s theme was “Blue and yellow” and I stayed safe using the stamping technique. 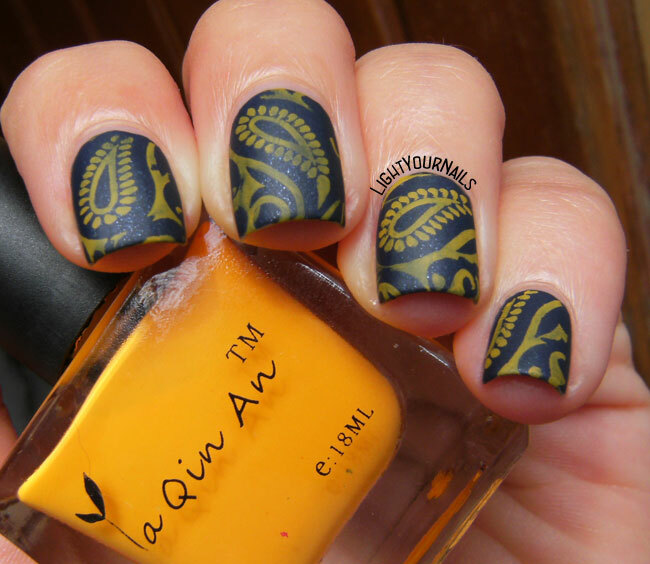 The blue base is P2 Be My Guy, which I’ll soon post a review of, while the yellow stamping polish is Ya Qin An #21. I had tried Konad yellow before but it didn’t work, it wasn’t visible enough on such a dark base. 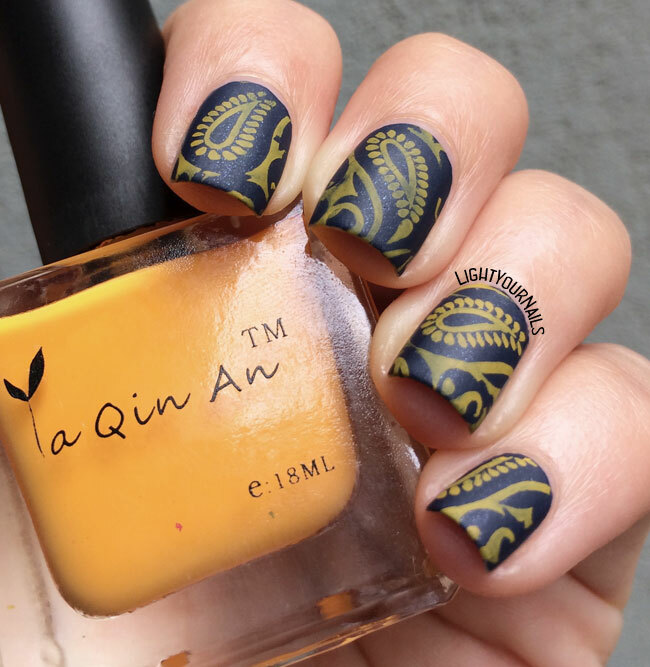 From this point of view Ya Qin An and BornPrettyStore stamping polishes are always 100% opaque, perfect to use over a dark base. I topped the manicure with TNS Cosmetics Flash Mat top coat. Vi faccio vedere anche il look originale, prima del top coat matte. I difetti dello stamping si vedono molto di più così. Non che ci siano parti mancanti, ma si vede bene come alcuni punti siano più colorati e alcuni decisamente più sbiaditi. Il top coat matte aiuta molto in questo caso. I am also sharing the original look with you, before the matte top coat. Stamping flaws are way more visible this way. Not that there are missing parts, but you can clearly see there are bald or discolored parts. Matte top coat helps a lot for hiding them! La plate che ho usato è la ND105* di Nicole Diary. La plate è bellissima come vedete, le immagini sono enormi e vanno veramente bene per chiunque. Altra cosa che mi piace un sacco è il buco nel cartoncino porta-plate, dove si vedono a colpo d’occhio i disegni. Ma qui arriva la nota dolente. Io non penso di essere una novellina con lo stamping, ma riuscire a far uscire qualcosa con questa plate è stato un dramma. La plate è poco incisa, l’inchiostro non si trasferisce sullo stamper, figuriamoci come può arrivare sull’unghia. Bisogna pulire la plate ogni singola volta, che vada bene o male. Ho provato 4 stamper diversi ma la storia non cambia. E non parliamo di quanto smalto ho sprecato nei tentativi. Questa cosa mi è molto dispiaciuta perchè davvero adoravo i disegni di questa plate. Tra l’altro ho sempre sentito parlare benissimo dei dischetti Nicole Diary quindi la delusione è stata ancora maggiore. Non posso che pensare che la mia plate sia di un lotto fallato. Te pareva! Vi farò sapere come va con gli altri 2 che devo ancora usare, incrocio le dita. Nel frattempo mi dite cosa ne pensate di questa nailart blu e gialla? Sono due colori che vi piacciono insieme? 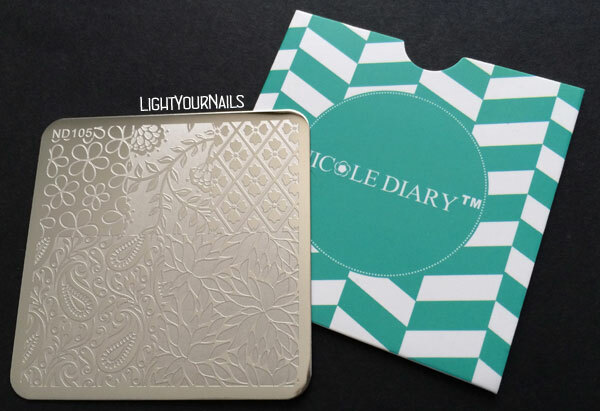 The plate I’ve used is ND105* by Nicole Diary. As you can see this plate is really awesome. The patterns are very big and work for everyone size wise. Another detail I like is that window on the cardboard backing where you can see what’s inside at first glance. But now to the sore note. I am no nail stamping guru but I also don’t consider myself a beginner and I’ve had a nightmare with this plate. It’s poorly etched and the stamper just doesn’t seem to pick up the polish. You gotta clean the plate each time, even when you don’t pick up anything. I’ve tried 4 different stampers that I use regularly and I had this issue with all of them. And don’t even make me think of the waste of polish for the numerous attempts! I am really sad because I was loving this plate’s patterns. 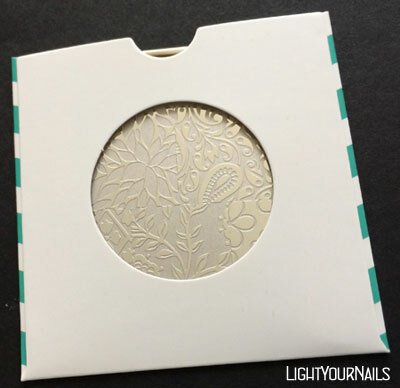 Plus I’ve always read good reviews of Nicole Diary’s stamping plates so the disappointment is even worse. I can’t help thinking my plate comes from a wrong batch. I own two more plates from Nicole Diary and I will report back about them, fingers crossed. 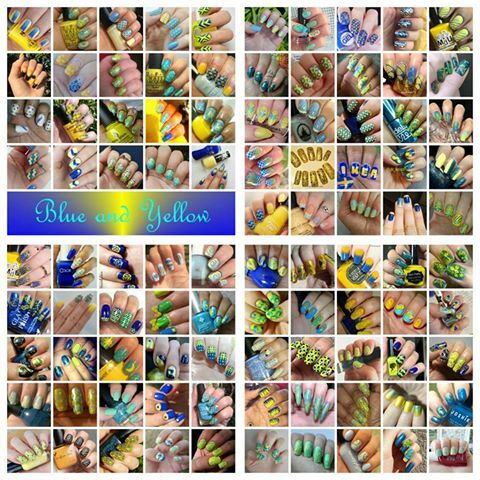 In the meanwhile please share what you think about this blue and yellow manicure. Do you like these two colours together? I love that group, so challenging and fun! I love that it's relaxed and I can join whenever I feel to! This is really pretty, good job! This is gorgeous. I love the look you created. Your mani turned out great! I had mine done just didn't get it up on time! Such a shame! I hope you'll show it on the blog anyway! Aww man, that's a bummer about the plate being difficult to work with. I really like the look that you created though! I love paisley and this colour combination is great. I wished I had known earlier! But now I know what to purchase when I need "colours"! I like very much that you made this one matte. Great review! Too bad it didn't work easily - it is so pretty. Mi piace tantissimo :) peccato per la 'plate' ( spero di averlo scritto bene). This is a great look! I'm pretty impressed with that yellow polish, it's hard to find one that stamps over blue without looking green. Ahhhh I love this so much, the colour scheme is just perfection and the design, I love paisley, so it's perfect! I really wished it had a better quality.